Viva Legato is a solid model for single-speed city bikes. It has an immodest, but highly practical design for everyday commuters. The stylish design and superior components make this bike ideal for serious city cyclists. This model has high rideability, and excellent grips and tires make this model suitable for almost all weather conditions. If there could ever be a perfect city bike, then products in the Viva Legato bike model will certainly fit. This model is the very definition of the bicycle. It has a very simple yet highly functional design. This is the ultimate city bike model that would be suitable for things like going to work, riding leisurely in the park, and delivering pizza. We know because we did all when reviewing this model. The bikes in this model have thin and lightweight frames. The frames are also high, so the model clearly favours cyclists with long legs. It’s easy to ride on one of these bikes for hours. The advantage of the slim frame is that it’s easy to navigate through pesky traffic on this bike. When you are riding leisurely and a car makes a turn to your way, it’s easy to swerve without losing balance. Cycling is not an endeavour on these bikes. This model can handle a number versatile city landscapes, except the most rough terrain. It has a single speed drivetrain, so the model is perfectly low maintenance. The 700c alloy wheelset is also quite sturdy. The price for each model is also quite low. 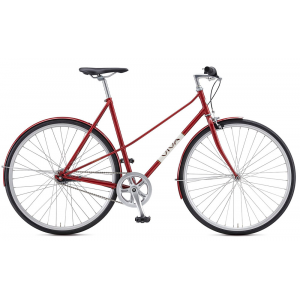 Viva Legato is the ideal bike model for people who use a bicycle as the prime mode of transport. It’s easy to maintain and also ride. It has a slim frame that easy to navigate through city traffic. Viva Legato comes with sturdy wheels that will not wear out easily with everyday use. This is a wonderful bike model for everyday cyclists.